Entertaining expert David Tutera opens his files to reveal a wealth of detailed information about creating that perfect day, featuring advice about everything from wording invitations to negotiating with caterers, planning the meal to throwing an event on a budget. 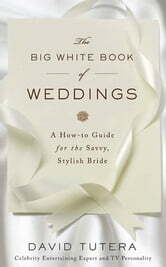 The same insight celebrity entertaining and wedding expert David Tutera gives to his A-list clientele is now at your fingertips in The Big White Book of Weddings: David's ultimate "how-to" guide designed to get every bride down the aisle in style! It's tough to be a bride on a budget—but David reveals his personal tips of the wedding trade that proves brides can be both sophisticatedly chic and realistically resourceful! Covering the entire wedding experience from brainstorming, budgeting, invitations, gift registries, food, music, traditional reception rituals, and even what happens after the wedding's over, Tutera has created a must-have for brides-to-be. Full of the personality that David brings to every wedding he plans and every TV show or magazine article he appears in, Big White Book of Weddings is the book every bride needs to make her wedding unforgettable for all the right reasons! - Create engaging menus and creative cocktails in "Eat, Drink and Be Married!" - Be Perfectly Polished with "Etiquette for the Elegant"
- Make your entertainment a hit without needing a rock-star budget in "Strike up the Band"